For a more extensive list of the types of cases our office handles, read on. I am Gerald W. Livingston. I have dedicated my entire professional career to personal injury law in one form or another to secure maximum compensation for clients who are injured. In negotiations or litigation, we do not waver in the pursuit of justice. Mr. Livingston is a qualified and seasoned mediator and experienced trial lawyer who is widely respected throughout the legal community for his experience and knowledge of the law. He has earned the highest peer rating possible of AV Preeminent* from Martindale-Hubbell, and he is listed in the Motor Vehicle Trial Lawyers Top 25. 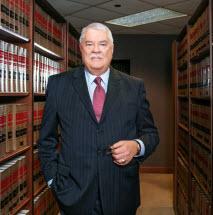 At The Livingston Law Firm, P.C., the goal is to make the process as easy as possible for our clients. As such, we are available and accessible to the people we represent. Additionally, we offer free consultations for the first visit, and in most cases, if your case is accepted, we are paid only if we make a money recovery for you. We provide fluent Russian translation services. At The Livingston Law Firm, P.C., you get to talk to a lawyer and not a paralegal or secretary. Your case is important to us. Leave the complicated legal tangles to us so you can focus on moving forward.